Elk jaar wordt ruim 41 miljoen ton e-waste geproduceerd, waarvan tot 90 procent illegaal verhandeld en gedumpt wordt. Uit cijfers van de VN blijkt dat de handel jaarlijks goed is voor 12 tot 19 miljard dollar. De totale hoeveelheid E-Waste. zoals afgedankte smartphones, computers en televisietoestellen, zal in 2017 stijgen tot 50 miljoen ton. Naar schatting 60 tot 90 procent van dat afval wordt illegaal verhandeld of gedumpt blijkt uit cijfers in het rapport Waste Crime (PDF). Interpol schat de huidige prijs van een ton E-Waste op zo’n 500 dollar (445 euro), waarmee de waarde van het illegaal verhandelde en gedumpte afval schommelt tussen 12,5 en 18,8 miljard dollar. Europa en Noord-Amerika zijn de grootste producenten van E-Waste, maar Aziatische steden zijn aan een snelle inhaalbeweging bezig. Afrika en Azië zijn de belangrijkste bestemmingen, met name Ghana, Nigeria, China, Hong Kong, Pakistan, India en Bangladesh. De uitvoer van gevaarlijk afval uit de EU- of Oeso-landen naar ontwikkelingslanden is wettelijk verboden. Daarom worden enorme hoeveelheden E-Waste als tweedehands goederen verhandeld naar ontwikkelingslanden. “A staggering 1.3 billion tonnes of food is produced each year to feed the world’s 7 billion people. Yet, according to the Food and Agriculture Organization (FAO), around US$1 trillion of that food goes to waste. With 200,000 new people added every day, the world can ill afford to waste such a massive amount of food. Global waste, however, does not stop at food. Consumers are increasingly buying products that are wrapped in plastics and paper. Much of this packaging – and eventually the products themselves – will end up in landfills. This trend has both health and environmental consequences, especially given the rapid rise of hazardous waste such as electronics. Innovative solutions to combat “e-waste” are emerging. Recovering valuable metals and other resources locked inside electronic products, for example, can reduce e-waste. Not only can recycling reduce pressure on the environment, it can also create jobs and generate income. Indeed, the global waste market sector – from collection to recycling – is estimated to be US$410 billion a year, excluding a very large informal sector. As with any large economic sector, however, there are opportunities for illegal activities at various stages of the waste chain. In the rush for profits, operators may ignore waste regulations and expose people to toxic chemicals. On a larger scale, organized crime may engage in tax fraud and money laundering. About 41.8 million metric tonnes of e-waste was generated in 2014 and partly handled informally, including illegally. This could amount to as much as USD 18.8 billion annually. Without sustainable management, monitoring and good governance of e-waste, illegal activities may only increase, undermining attempts to protect health and the environment, as well as to generate legitimate employment. 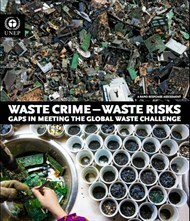 The evolution of crime, even transnational organized crime, in the waste sector is a significant threat. Whether the crime is associated with direct dumping or unsafe waste management, it is creating multi-faceted consequences that must be addressed.” Achim Steiner UN Under-Secretary General and UNEP Executive Director.